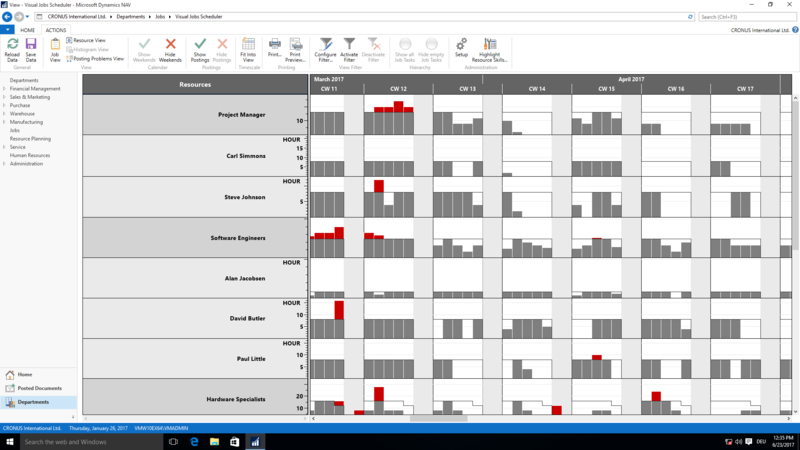 The Visual Jobs Scheduler is a fully integrated add-in for Dynamics NAV. It visualizes jobs, job tasks and job planning lines and resources and allows intuitive drag & drop project scheduling. 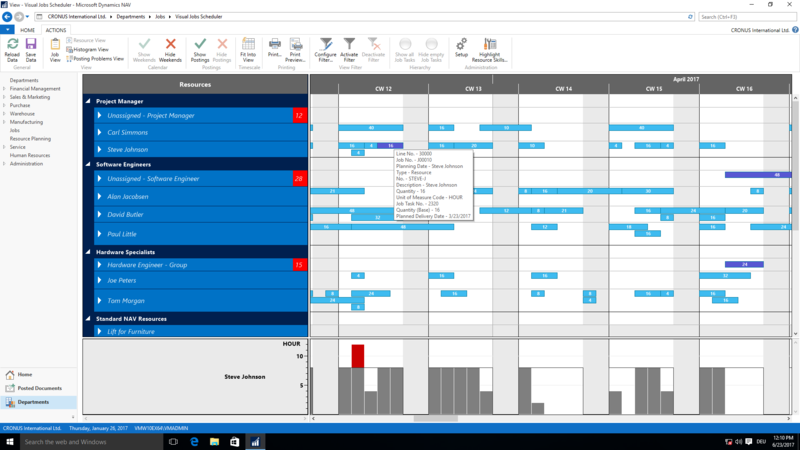 The Visual Jobs Scheduler (VJS) is an add-in that fully integrates into the jobs & resource planning module of Microsoft Dynamics NAV. The VJS provides the user with an interactive project and resource schedule and allows an easy and intuitive drag & drop scheduling of jobs, job tasks, job planning lines and resources. The add-in is based on the Dynamics NAV standard functionality and can get installed without changing any existing NAV object. 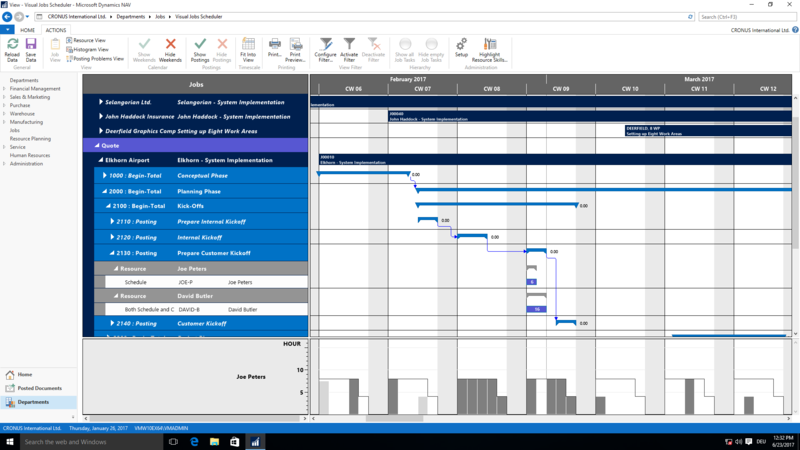 Empower Project Planning With NAV: Make It Visual! If a picture is worth than thousands words, a video is worth thousands pictures. 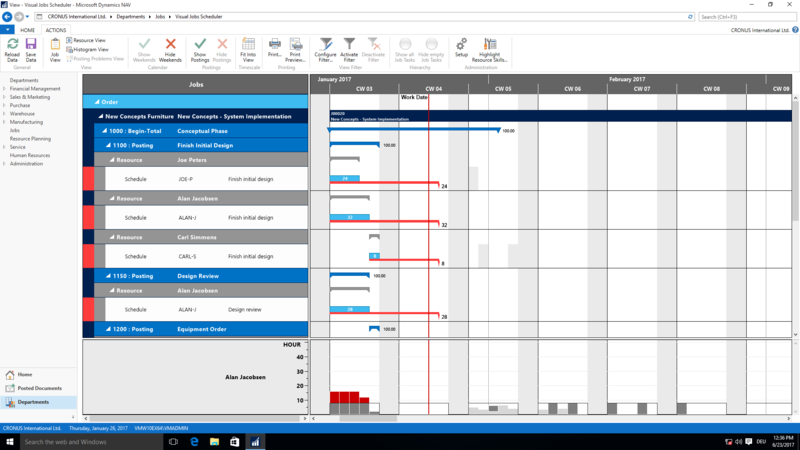 So, here you go with a short video introducing the Microsoft Dynamics NAV Visual Jobs Scheduler to you. Especially the jobs modules "buries" data in a deep hierachy of tables: jobs, job tasks, job planning lines and resource allocations. See all of this data at one glance. All of this is presented to you in the natural way you look at projects: as a project plan Gantt chart and a resource Gantt chart. Transparently seeing all the project- and resource-related data is the necessary first step to fully understanding you project plan and your resource situation. With the VJS, you quickly understand dependencies, conflicts in your schedule and any unwanted issue. Want to resell the Visual Jobs Scheduler? Visually plan jobs, job tasks and job planning lines and resources by simple mouse actions such as drag & drop. The VJS both supports horizontal movements (i.e. modification of start and end date) and vertical changes (i.e. modification of resource allocation). At the same time, you can implement and visualize dependencies of job tasks by simple interactions. The VJS helps you overcome an inherent weakness of the Dynamics NAV standard jobs & resource planning capabilities: with the VJS, you can assign job planning lines to a resource group and then move them to a concrete resource at a later point of time. This is achieved without changing the Dynamics NAV standard and enables the user to apply a proper rough and fine project and resource planning within one tool. 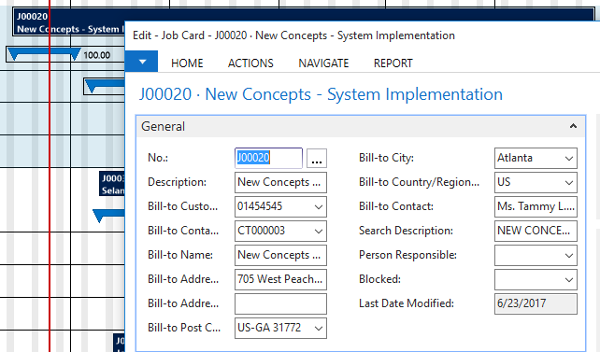 Another deficiency in the standard Dynamics NAV jobs module is the inability to link jobs, job tasks and job planning lines in order to reflect and take into account logical dependencies within the execution of the project. With the VJS, you can create these dependencies by literally painting them within the graphical project plan Gantt chart. Once jobs, job tasks or job planning lines are linked, these dependencies are taken into account when drag & drop changes to the schedule. The Visual Jobs Scheduler is not just an interactive Gantt chart as you might know it from other project management solutions. Along with the position of jobs, job tasks and job planning lines in terms of time and their allocation to single resources it also shows the respective resource utilization. If moving a job task results in an overload, an optical warning will be given so that you can react immediately. Of course, this happens in realtime. The VJS fully integrates in Microsoft Dynamics NAV. It directly connects to the NAV database and does not require the implementation of another database (with the then inherent replication needs). The add-in makes use of the Dynamics NAV client extensibility framework and is "just" a typical NAV page. This tight integration brings a couple of benefits for the users: they do not need to learn a new UI, they can continue to work in their standard ERP environment and they a get a couple of shortcuts from the visual scheduling add-in to the ERP system: E.g. double-clicking a job open the respective job card. Take a deep dive into the Visual Jobs Scheduler and see how it can help you better sell NAV. 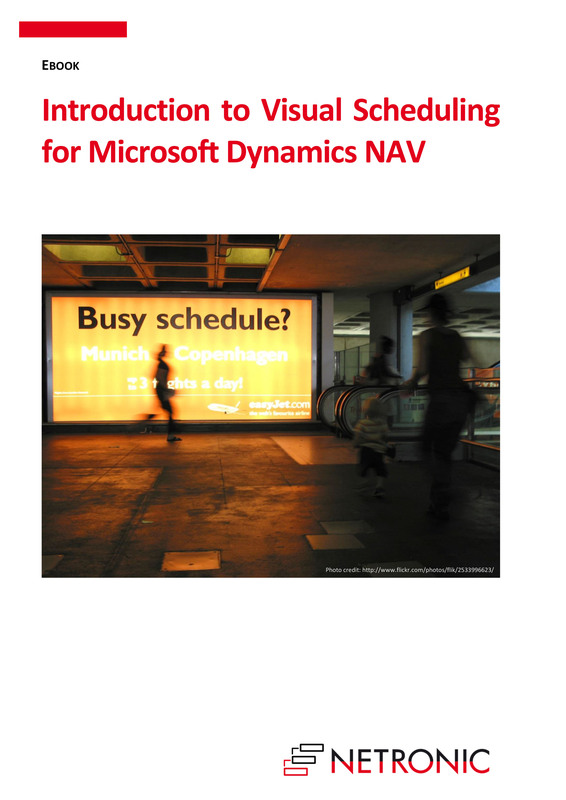 The purpose of this 32-pages Ebook is to provide you with ideas and best practices of how to apply visual scheduling to Dynamics NAV. We run regular webinars - typically in a monthly rhythm. 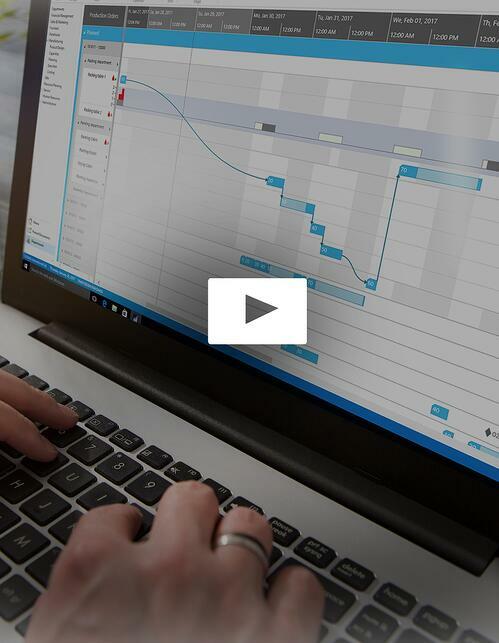 Join on us for one of these live sessions in which we cover all add-ins of our Visual Scheduling Suite for NAV. We regularly blog about our visual scheduling add-ins. Here is what we published recently. And see why hundreds of global Dynamics NAV partners already resell the VJS. Any question? Please let us know.